Nashville is a city dominated by Country Music but it's possible to find a "rock star" haircut if you know where to look. 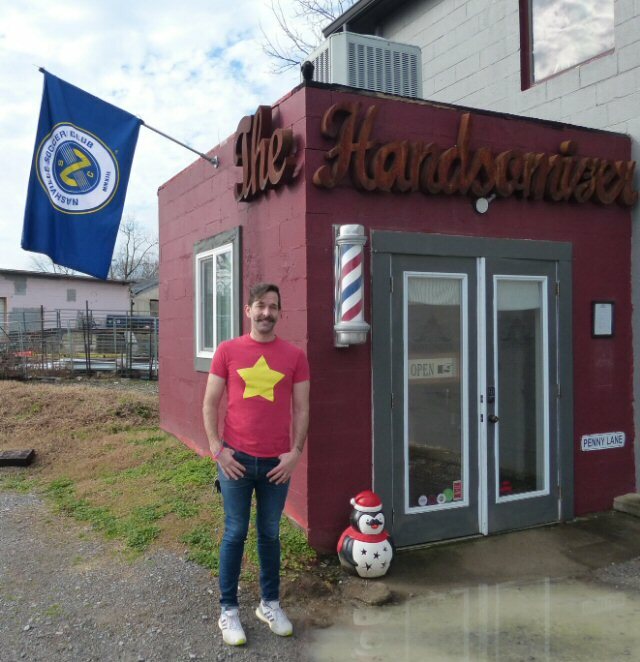 Stephen Mason - Master Barber - outside The Handsomizer in Nashville. As a longtime fan of the band Jars Of Clay I jumped at the chance of having my head fixed up by their Grammy-Award winning guitarist Stephen Mason. Like Daniel in the Bible, Mason saw the writing on the wall several years back and realized that a full-time career in the ever-changing music industry might not be the sustainable profession that it once was. So, the talented musician added another skill to his impressive tool kit when in 2014 he qualified as Master Barber and soon set up shop as The Handsomizer in Nashville. The quaint storefront features room for The Handsomizer, his lone Prohibition-era barber chair and a row of three seats that serve as his waiting room. We enjoyed our experience on a late December morning that found a personable Mason greeting us like an old friend before applying a soothing massage with an electrical device straight out of the 50's. We gave the well coifed Mason - who looks every inch like the old school barber complete with handlebar mustache - a challenge with a head of hair that hadn't been cut in over a year. But, he completed his task in a cheerful manner before sending us on our way with a post-clip hot towel and shave. We learned in the chair that even though his band rarely takes to the road anymore Stephen often does as a proud member of the Nashville SC Soccer Club support group called The Roadies. His loyalty to the town's newest sporting franchise was on display as their colors were flying in the breeze outside his shop. He won't have too long to commute as their new stadium will soon be built just up the road from his place of business. We also found out that Jars Of Clay haven't completely closed the lid on performing live. Mason told us that he expects their Christmas concert in Franklin to become an annual tradition and the band will hit the big stage at the Bridgestone Arena on April 30, 2019 as part of a celebration of fellow Christian artist Michael W. Smith's thirty five years in the biz.